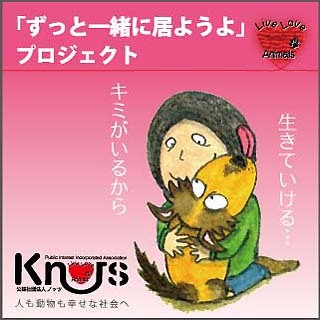 Live Love Animals Support activities for pet owners affected by the Great East Japan Earthquake. Kobe city itself suffered a catastrophic earthquake in recent memory so we have some understanding of what people must be going through in Tohoku. We also acutely feel the ever-present need to realize a society within which ‘always being able to stay together’ (with our pets) is accepted as a norm. This is not just an issue to be addressed in times of disaster because there are several problems which the best of owners cannot solve by themselves even in times of non-crisis. So let us consider how to find solutions together. Workshop 4 of the ‘Live Love Animals: 2nd International Conference on Animal Care Kobe, 2012 held at the Portopia Hotel on Feb 19th 2012. The title of Workshop 4 was ‘Always Be Together: Protecting the Normality of Daily Life for Owners and Pets’. There are many forms of crisis other than those caused by natural disasters and the capabilities of owners to cope in such circumstances eventually reach a limit. From the viewpoint of ‘protecting everyday life’, the workshop provided the opportunity to think about the social relationship between people and their pets. “We will always be together”: When we first welcomed our pet to the family, we made this promise to our pet. Society expects owners to take the responsibility of caring for their pets till their very last day. However, if an owner’s ability to fulfill this obligation becomes limited, we think there should be a system in place to support such situations. For example, many older people wish to take care of and send off their pet as they near the end of their own lives. However, their own advanced age and infirmities may prevent this, which must be a terrible worry. But what if there was a support system? Imagine if they could spend their last days with their beloved pet in happiness and without that worry. Statistics show that a major reason for pets being given up is the increasing number of owners growing too old. Behind the statistics there is obviously a great deal of sadness. We should be able to do more for the realization of happy society where people and pets can live together till their respective ends. So, alongside the actual support work during the crisis, the ‘Always Be Together’ project has been examining the question of ‘what makes up a society in which people can be with their pets all the time?’ We intend to work towards such a society as we continue on with support work. Thank you very much for your donations to ‘Always Be Together’. We have raised 126,169, and decided to donate it to the ‘Ann Project’. (We will be sending 124.489 which is the total amount after handling fees)’. 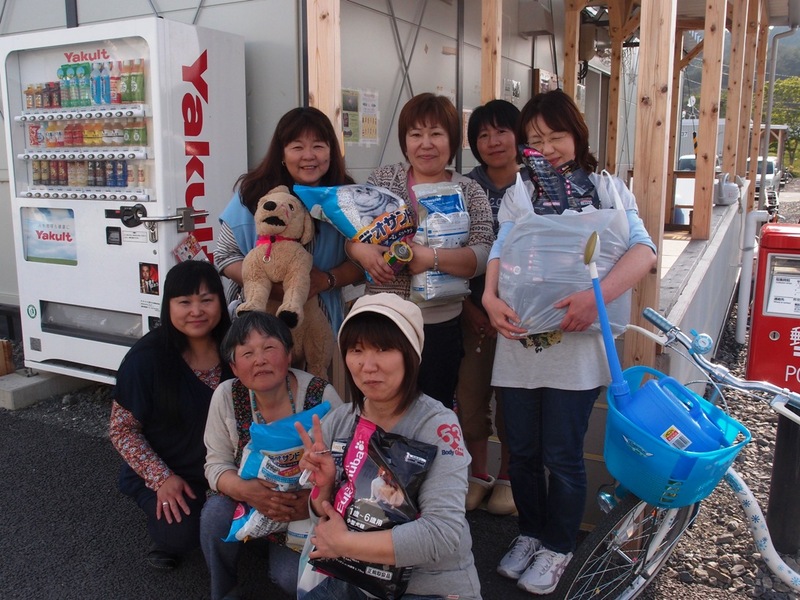 The ‘Ann Project’ is a support program to help pet owners living in temporary houses and led by Veterinarian Yoko ABE of the Abe Animal Hospital in Ishinomaki City. (Dr. Abe was one of those who gave a talk for Workshop 4 at the ICAC KOBE 2012 conference). We would like to help those owners who are trying to move and establish new life from the temporary houses. It has been one year and five months since the Great East Japan Earthquake. On that day many people and animals lost everything including their daily livelihoods all at once. The trauma of losing so much has never gone away and still remains. The animals have suffered these traumas as well. The stress of changed living environments and moving from refuge to temporary housing must have been almost unbearable. Both people and animals have been in great need of help and support. The temporary housing being supported by the Ann Project reaches two cities and one town, namely Ishinomaki City, Higashi Matsushima City and Onagawa Town in Miyagi Prefecture. Fortunately the temporary housing in those places does allow for pets living together with owners. However in reality, the people living in those temporary houses originally come from different neighborhoods. So they have had to cooperate with strangers in day to day life and inevitably encountered concerns such as the barking of animals. So many owners are feeling the stress. The animals themselves have, in many cases, become highly nervous about the changed environment and people around them. 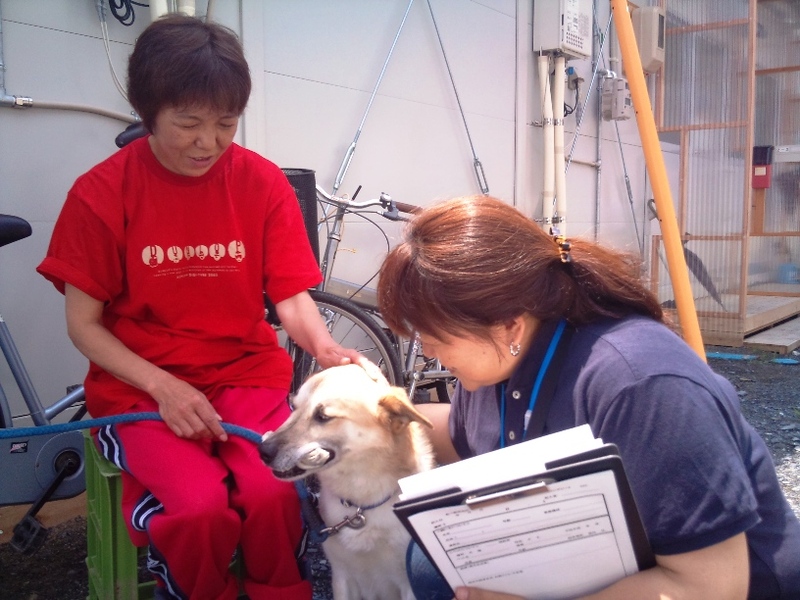 They too have experienced the terror of an earthquake and tsunami so there are many instances of behavioral problems such as barking, uncontrolled excretion and an aversion to being separated from their owners. ople around them as friends they can live with together. So we aim for temporary housing that is filled with liveliness and happiness! We are creating a network to alleviate problems that people sometimes face when living with pets in temporary houses, both the people who own the animals and people who don’t. Through such support activities we seek to help people overcome their difficult situation and ensure that people can remain with their animals together in these places. Here is a great tip from Yoko-sensei. 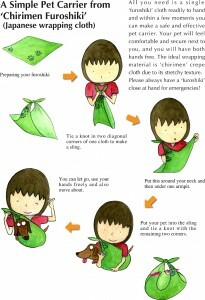 It is called a ‘furoshiki’ in Japanese – a piece of square wrapping cloth that allows a simple, yet effective, support for escaping from danger. The idea was born from pet-owner experiences while escaping the Great East Japan Earthquake. So, if you are a pet owner, how about practicing this yourself? Just in case! Click here to open a page of detailed instructions.